About a dozen of us from the Potomac Mountain Club headed out for a day trip to climb at the relatively off-the-beaten path crag known as Indian Grave Ridge. The crag is located about halfway between Luray and Front Royal, Virginia in the Massanuttens and is considerably remote for a day trip—long drive up a dirt road and a 45 minute hike to the crag. Climbs range from trad, bolted sport, mixed, and top rope. There are a fair number of routes to climb starting at 5.6 and going up from there, though most tend to be in the 5.hard range. To get there you must drive in from the south, via the town of Luray, across the Shenandoah River and northbound on the S Page Valley Road. Follow the road along the river until it turns to gravel and then keep going… A sign for Indian Grave Trail will point out the parking area, which is suitably large enough for at least a half dozen cars. From the parking lot follow the easy hiking trail. After about 35 minutes or so you will come to a small sign indicating the climbing trail, follow it down to the base of the cliff. You will pass by a couple smaller cliffs and rock outcroppings before arriving at the main portion of the crag. The first of the routes you will come across is the 5.9 finger crack, Premature Ecrackulation, which is probably the premier route at Indian Grave Ridge and the one that people mention when they talk about this crag. I climbed this route on top-rope, and it is quite fun—there are really only two or three real finger crack moves in it, because after that it transitions to a larger crack with loose hands; it has pretty terrible feet and is sustained. I saw two different leaders fall on this route that day, but it takes good gear most of the way up, with the exception of the last portion to the bolts which is a little run out. I’m not any good at crack climbing, but it was challenging, fun, and worthwhile. Around the corner from the finger crack is a 5.12 bolted route, and right beside it is a 5.7 bolted route (Just This Side of AARP) and a 5.6 trad route (Gunkness). Those two routes are about the most moderate available at Indian Grave Ridge, and were both a lot of fun to follow. Gunkness has a little mini roof to pull through—it is one of the few routes without bolted anchors at the top. A lot of the other climbs are quite challenging—I hopped on a wacky one down toward the end of the cliff that had some fun underclings and little bulges, and then just transitions into an absolutely featureless wall… I don’t think any of us made it through that part—just flailed around on top rope for a bit. 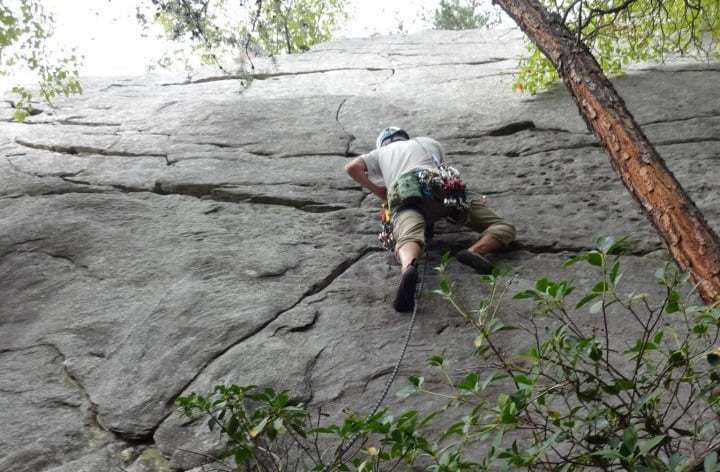 Well, I certainly wouldn’t characterize Indian Grave Ridge as a destination climbing area, but it’s worth looking into if you are hoping for a change of pace from the usual Mid-Atlantic climbing destinations or if you are just looking to avoid the crowds. The rock all seemed to be pretty good quality sandstone, and there are a handful of enjoyable routes that range from about 25-35 feet. Most of the routes have bolts at the top, and you can also easily walk off by going all the way around (north).